Assemble the Romulan Battle Cruiser in 1:1000 scale! As seen in "The Enterprise Incident" episode from the original series! 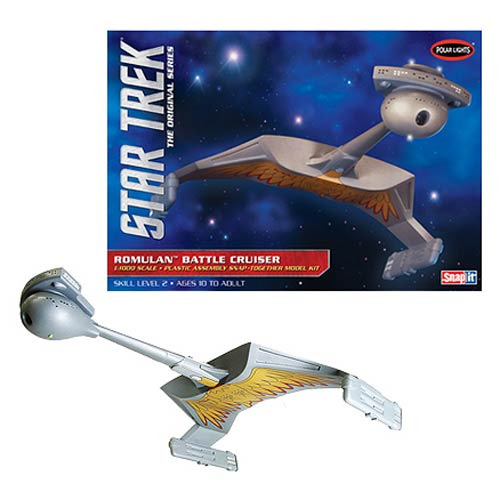 Assemble your own Star Trek Romulan Battle Cruiser 1:1000 Scale Snap-Fit Model Kit! Besides the Klingons, the most well known villains in Star Trek were the Romulans. It is a little known fact that the 2 enemy races had formed an alliance that allowed them to trade military technology with each other. One result of the pact was the Romulan version of the D-7 Battle Cruiser as depicted in "The Enterprise Incident." In the original series episode, the U.S.S. Enterprise was surrounded by Romulan commanded versions of the ship. This kit brings the concept to life with blazing Romulan bird graphics that truly set it apart form its Klingon counterpart. No glue or paint required. Skill level 2. Recommended for ages 10 and up.